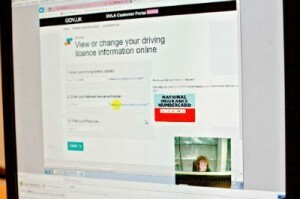 Last week we tested the section of our new integrated enquiries platform Alpha version that allows drivers to check their driving licence record online. Testing the prototype with real customers is essential to ensure we deliver something they want to use not what we think they want. The insight gained from the testing will allow us to build a service that’s easy to use and most importantly is built with our customers’ needs at its heart. This is the 5th round of testing we have carried out with real users. We’ve learned so many things along the way. This latest testing was conducted at our Richard Ley Development Centre Swansea in which we have a dedicated user testing facilities –as product owner I was keen to see it in action. On my arrival I was met by Kay John from our usability testing team who took me through to the testing rooms. One room was set up for the customer to access the service and had recording equipment to capture every move. The second room had a monitor to view the testing taking place next door and allowed us to listen to the user comments; it felt a bit like watching an episode of Big Brother. For this round of testing I wanted to get insight from two distinct user groups. I had asked the usability team to bring in one set of customers who were regular internet users and one set that never use the web. The aim of testing with the second group was to assess how much assistance non-internet users will need to be able to use the service. The results were encouraging as once the non-internet users had accessed the page they found it really easy to navigate. Feedback from the testing included - “I’d give the system a 9 and I am a thicko, I would give 10 but the observers next door would think I am crawling”, “Very clear layout of screens, easy to follow and used words I understood and not office jargon” (78 year old inexperienced user) and “If you can’t understand this site there is something wrong, it’s pretty well spot on”. (74 year old inexperienced user). There were also comments that made me think that some changes were needed - “The More button doesn’t jump out at you it needs to be more visible as it is tucked out of the way” and “I would ring up, people don’t send letters anymore”. As this testing was in Swansea I was able to invite the whole development team to view tests throughout the day. This give the team a better understanding of the service user and they all went back to the office with ideas of how it could be improved. As I watched the tests, improvements suddenly jump out of the screen when I see people having difficulty accessing certain sections. The beauty of this type of testing and our Agile way of working on team is that I can quickly scribble down notes and pass them on to the development team to keep improving the service. It’s onwards an upwards from here for usability, the next testing is quickly approaching in Glasgow, I’ll let you know the outcome.